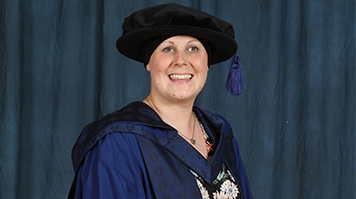 Dr Kate Granger was awarded an Honorary Doctor of Science at the London South Bank University (LSBU) Honorary Awards Ceremony in 2015 for her fundraising achievements with her #hellomynameis campaign. Kate was a specialist registrar in geriatric medicine at Mid Yorkshire Hospitals NHS Trust and has been battling with soft tissue sarcoma, a rare form of cancer, since her diagnosis in 2011. After the impersonal treatment she received both from the doctor who first broke the news that her cancer was incurable and by other healthcare professionals she encountered along the way, Kate utilised the power of social media with her #hellomynameis campaign. The campaign went on to win the backing of more than 400,000 doctors, nurses, therapists and porters across 90 NHS organisations and three days ago achieved Kate’s fundraising target of £250,000. Find out more about Dr Kate Granger’s work through her #hellomynameis campaign.